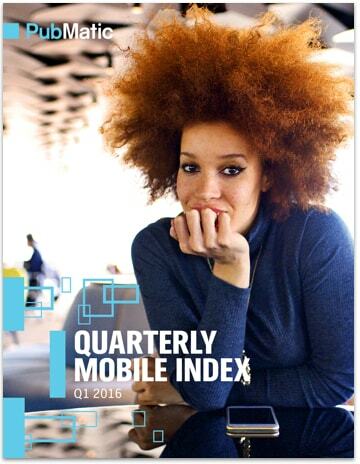 The Quarterly Mobile Index (QMI) report was created to provide both publishers and advertisers with key mobile advertising insights. By analyzing the billions of daily impressions that flow through our platform, we are able to observe real-time developments in the mobile space that allude to broader digital industry trends. To provide best-in-class mobile tools and services, we believe that information sharing is crucial in aligning the digital industry towards best practices and ultimately growth in mobile. The Q1 2016 report found five key trends, including detail around increased CPMs year-over-year for Android app and mobile web inventory, and increased advertiser demand for mobile private marketplace (PMP) inventory around the Super Bowl and March Madness NCAA Tournament.